Sabrina Rizk is the author of the Hannah & Amy Go to children’s book series. In 2015-2016, Sabrina and her family spent six months traveling through 10 countries on five continents. Sabrina wrote this series as a way of sharing the adventure with other children. Sabrina lives in California with her husband, two daughters and two cats. 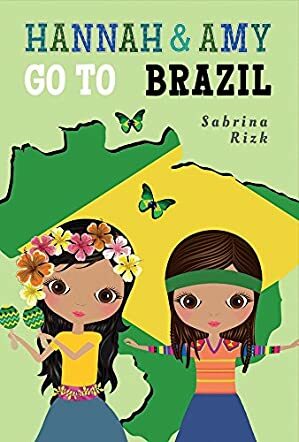 Hannah & Amy Go to Brazil by Sabrina Rizk takes young readers on a journey along with Hannah and Amy to Brazil. Readers learn about the country, its culture, people, places of interest, and customs through this book. The real life adventures of these two sisters have been captured well by the author, and children get to see the Iguazu Falls, Parque das Aves, and the sights and beaches of Rio de Janeiro through the eyes of these two girls. So let's all get started and go to Brazil along with Hannah and Amy and enjoy the trip! I like the book very much for the fact that the story, characters, and pictures are all real, which makes it genuine and will help young readers connect well with it. Hannah, Amy, and their parents encourage traveling through their experiences and personal stories and will motivate children to discover new and distant lands. The ‘Did You Know’ in the book is very informative and educates readers on many new things that they do not know about Brazil, its sights and sounds, and places of interest. Readers will find these kinds of books appealing as they get to learn new facts and things from the personal experiences of other children who have traveled. That makes it easy for them to understand and widen their knowledge in a fun, easy, and interactive manner. The glossary at the end of the book is helpful. I cannot wait to read the next book from this author where we get to see and learn about South Africa!